The ECB meets Thursday, and it may be best conceived as a transition meeting. It will lay the rhetorical groundwork for two things: a likely downgrade to the staff's growth forecasts and moving toward a new round of long-term loans (targeted long-term refinance operations). Draghi's speech last week to the European Parliament anticipated the themes he can be expected to develop in his press conference on Thursday. The euro area economy is weaker than expected, and it can last longer than anticipated. The economy continues to require extensive support, just not net new asset purchases. Nevertheless, with a firm labor market and increasing loan demand, Draghi is reluctant to fan fears of an area-wide contraction. The small rise is better than a small decline but is unlikely to change views or herald a rebound. In fact, the ECB's forecast for this year of 1.7% is a bit on the high side. The IMF's new forecasts put it at 1.6%. Markit sees it at 1.4%, and the median in the Bloomberg survey is 1.5%. 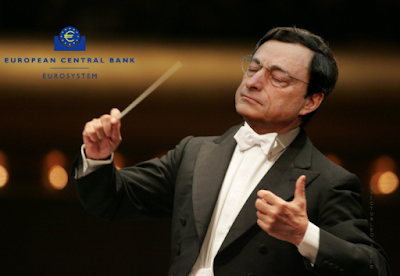 Draghi has already indicated there has been some preliminary discussion of a new TLTRO. These are long-term (four-year) loans given to banks for lending to households and non-financial businesses. An earlier program saw banks borrow almost 490 bln euros. These borrowings are to be paid back starting in June 2020. However, after this June, when the loans have less than a year left, they are used in calculating banks' short-term funding ratios, at the risk of oversimplifying. The idea is to avoid this squeeze by allowing banks, primarily in Italy and Spain, to roll the loans out further. The maturing TLTRO is roughly 2/3 of the outstanding TLTROs and around 1/5 of the ECB's balance sheet. The maturing of these funds, without a new facility, would be seen by officials and investors as an unnecessary tightening. Draghi may hint a new offering, but there is no immediate rush. It could be announced in March for implementation starting in June or July. The euro edged down to about $1.1335 today, its lowest level since January 3. It has not traded below $1.13 since the middle of December. It has not closed below this floor since late November. Any dip below there in response to the ECB meeting may prove to be a buying opportunity as the focus shifts back to the US with a "patient and flexible" Federal Reserve meeting and what will likely prove to be a soft jobs report on February 1. The euro's surge through the top of its range (~$1.15) earlier this month, perhaps partly fueled by the conversion of some dollar bond proceeds into euros (e.g., Turkey), was not sustained, we don't expect a break lower quite yet. .When the event risk of the ECB meeting passes, we look for the euro to recovery back through the middle of its range.